Para-sailing is one of the thrilling outdoor fun activities that you can enjoy with the whole family during your summer vacation in the Ozarks. The American Parasail in Branson offers every family a unique flight experience on a 10 to 15 minutes of thrill and excitement that soar up to 250 feet above the water on a 500 feet of line. The para-sails can carry up to 3 passengers at a time, weather permitting, which makes the thrilling flight a memorable family experience. 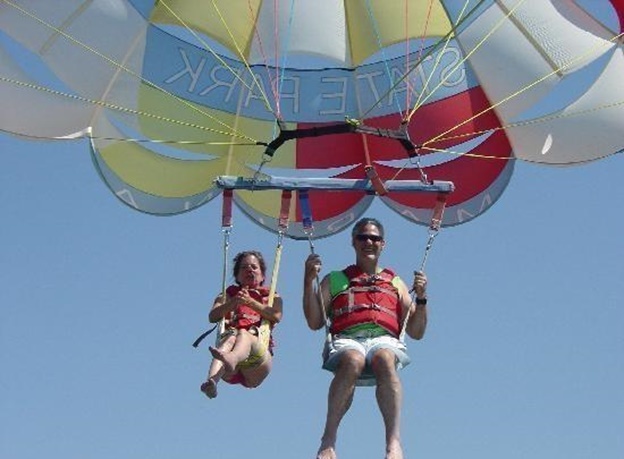 Anyone 5 and older can enjoy the great outdoor fun and excitement of parasailing. As you start the flight, you will be fitted with a harness and life jacket and soar through the air like a bird in flight as you fly over the beautiful Table Rock Lake. For a true exhilarating outdoor fun experience on the lake, fly with the American Parasail and don’t forget to take with you smartphone and take the best selfie as you are strapped in a harness that is attached to a parachute, and then get ready to be pulled in to the air by a boat. As you soar above the water, just relax, enjoy the spectacular view of the pristine waters of Table Rock Lake. The screams you will hear over the pristine waters of the lake are not because the novice sky flyer is panicked but rather due to the thrill and excitement he is enjoying in the air. Parasailing is a thrilling sport not for the faint of heart, yet it continues to grow in popularity as anyone from age 5 and older can enjoy the fun and excitement of this great outdoor fun adventure. During summer season in Branson, parasailing is not an uncommon sight where you see colorful parasails soaring high above the skies of Table Rock Lake while being pulled by powerful ski boats. The uniquely designed parasail with a tow yoke harness and special fabric was first towed safely over water in 1974. Credited with the most of modern day parasailing equipment is Mark McCulloh of Miami Florida. McCulloh invented the most famous Winchboat, which provides a powerboat with a winch system to launch and retrieve parasailors right from the boat. Parasailing equipment is being improved continually to enhance the sport and its safety. On your next visit to Branson, don’t forget to try parasailing. Hourly flights are offered at American Para-Sail from State Park Marina on Table Rock Lake and also at other locations for a pre-arranged flights. Would be flyers take off and land in a custom parasailing boat that’s equipped with the newest and safest technology in parasailing. With a highly skilled boat captain in charge, you don’t even have to get set. The 8 to 10-minute parasailing adventure can accommodate six flyers per trip at about $80 per person. This summer season, why not give it a try if you want to experience the unique outdoor fun adventure of parasailing to your Branson vacation list of activities.